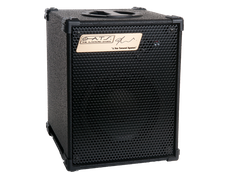 Firstly, here’s what ATS say about the cab: Super lightweight and compact 1x10 bass guitar cab. Equipped with one 10” Custom Woofer with Neodymium Magnet in a innovative cabinet with three tuned levels, and one high efficiency compression mid-tweeter. The high frequency level is determined by the setting of the dedicated knob on the rear panel. The range level is from complete exclusion to +12 db. Both cabinets are high quality constructions in a durable coating that is tough enough to withstand most knocks and bumps. The cab has a metal grille (with a mounted plate containg the ATS logo and a signature :O) and rugged plastic corners - allowing for easy and secure stacking. The cab has a recessed, top-mounted carry handles for easy moving about and, at a mere 10.5 kg, should prove a simple, and back friendly lift. The cab has two Speakon connections at the rear of each unit along with a level control for the tweeter, which ranges from a -9 dB cut to a boost of +12 dB. At just 445mm high, 355mm wide and 385mm deep, this cab handles 300 watts effortlessly. For a relatively small enclosure, the cab has a unique voice that remains articulate irrespective of the volume. As a stand-alone cab, the SL310 has an articulate, punchy tone with enough bottom end to satisfy most small to medium-sized venues. However, adding a second SL310 is sheer aural paradise! None of the articulation is lost and the bottom end is still very defined. What is immediately noticeable is the spread of sound. Obviously, placement of the cabs is crucial and, as with any bass cab, poor positioning or placing it on a resonant surface, or more commonly a pub chair (!) will compromise its voice. Using the ATS LBA5, provides a great combination with the SL310. Running a flat EQ, the response from the single cab, and both SL310’s, is sufficient to please the most ardent audiophile. You can push the cab volume-wise with no noticeable break-up of the signal. The tweeter control is a great way of tuning the cab to the acoustics of a venue or simply to proved a range of tones that work their way through the smooth, velvety lushness to a more transparent tone that cuts through the mix without any trace of harshness. Givedn their robust construction, these cabs have carried out their role perfectly time and time again. It’s so reassuring to simply link up the amp and cabs and concentrate on the performance without ever a thought given to a potential back-line issue. Obviously, tramsporting the cabs in padded covers goes a long way to preserving their integrity and appearence. BHut I would suggest that providing you don’t mind a few rough edges or marks, then these cabs are built with a ruggedness that will more than test any roadie’s ability to inflict ‘character’ or the proverbial ‘raodworn’ look to your gear. Simple - ATS customer service is second-to-none. ATS are people who care about their products and the people who use them. In the competitive world of bass gear reliabilty in every aspect is everything and ATS are rapidly building a distinctive reputation. OK, you will argue that I’m bound to give a glowing review of a piece of gear that not only bears my name but was a collaborative project. However, given the range of brand named gear that I’ve used, I can genuinely say that ATS gear is stunning. The cabs may not rate highly on the ‘bling’ scale but, let’s face it, this is back-line gear with an emphasis more on being heard rather than seen! A great piece of kit, which I’m proud to use.